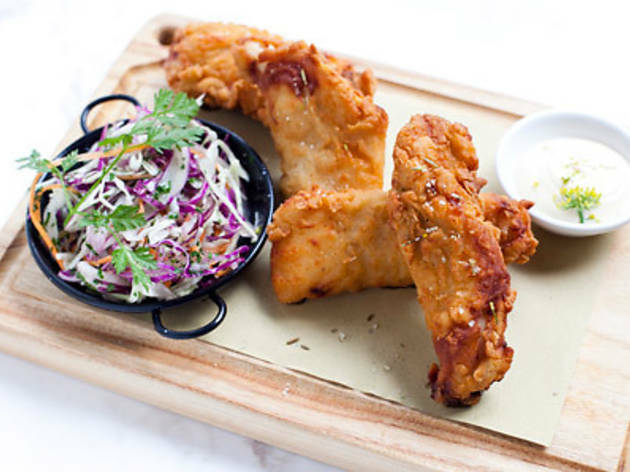 If you’re game, you can knock over all four big, new Surry Hills openings in one evening. We’re not joking. Start at modern Italian bunker Berta during aperitivo hour for salami chips and a Negroni; move onto Bar H for the lardo on garlic toast and a boutique beer; trot upstairs to the bar at Argentinean hotspot Porteño and have a cocktail with a few bar snacks; then make your way to District Dining – the new restaurant from Warren Turnbull. You might know the kiwi chef from such restaurants as neighbourhood fine diner Assiette and, if you’re old and rich enough, Banc. District is a step away from what he’s doing at Assiette – it’s a much more casual offering, nested above the Railway Hotel across from Central Station. Word from the floor staff is that he’s also doing the pub meals downstairs, too – you wouldn’t know it from looking at the menu but there may be treasures hidden to the naked eye. We’re not going to puff on our pipes and talk too much about how different District is to Assiette but here are the facts: Turnbull’s food, which snaps, crackles and pops with surprising intensity at Assiette, just kind of drips and fizzes at his new digs. But treat this casual eating house as exactly that and not a diffusion of Assiette and you’ll have a good time with dishes such as the nuggets of sweet corn and king crab, deep fried and served with a crab and basil laced mayo. Oh, and try the deep-fried quail eggs with their perfectly runny scarlet yolks, draped in white anchovies. There’s smoked eel pâté (more smoky than eely) with ribbons of lightly pickled cucumber served in a little District Dining-branded eel tin, and pork brawn (little hunks of brawn caught in jelly and served in a little jar) laced with a line of pickled vegetables. Both come with house-made flatbread slathered with green onion paste. The flatbread’s not a bad idea, but the green onion overpowers everything else on the plate – a bit of toast would be great. Our advice? Order one or the other, and order some bread on the side for the pâté or brawn. A spring roll of rich-yet-slightly-dry beef cheek is more exciting on paper; order the fried chicken and coleslaw instead. In fact, if you wanted you could pretty much just rock up, sit on the balcony and drink a few Whale Ales or a bottle of Bandol rosé with a couple of chopping blocks piled high with pieces of boneless (why not do it on the bone for more flavour? 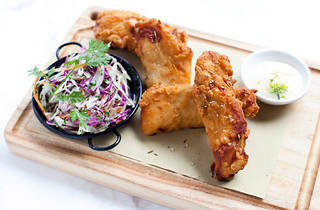 ), lightly crumbed-and-fried-till-golden chicken. Dessert-wise, go the the little jar of cool, creamy rice pudding served with a generous quenelle of cinnamon ice cream. If you’re as big a fan of Assiette as we are, you might find District Dining disappointing, despite the excellent floorstaff and exciting wine list. But if you’re happy to check it out, have a few drinks and a few bites to eat. It’s a good place to have dinner before you hit Ding Dong Dang next door for karaoke.